Today is the final day of the March 2017 Sumo Basho (tournament). 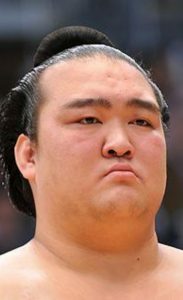 The contender to win this basho was, up until two days ago, Kisenosato, the Japanese champion whose famous rise and fall through the ranks has lasted over a dozen years. 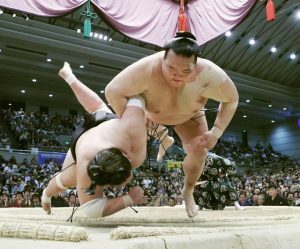 Kisenosato’s very public struggle to attain a high rank in sumo is well known in Japan, and his career has been on a forwards-backwards ride since 2004. 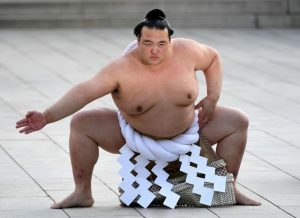 He entered sumo training when he finished junior high school, around age 15 and his first tournament was at age 17 and 9 months, the second youngest ever to enter at this age. Taking a close look at his face we can see two outstanding features to begin with, Of particular importance is the area affecting his career, do you know where it is? In the centre of his forehead is a large and prominent indentation and a scar. I wonder when this occurred? It is an old scar and the injury most likely occurred in his youth, perhaps when he was playing baseball in junior high school (although in sumo there is also alot of ‘head banging’ which probably made the injury worse). It could have even occurred much earlier (as indicated below, when he was much younger). The central forehead is the location of career success and his ability to communicate with seniors. 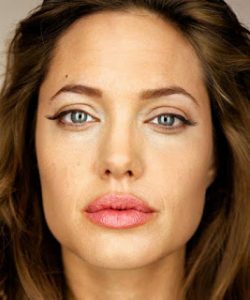 From my own observations in face reading and the study of Chinese Astrology (Bazi/Four Pillars), this area relates to ‘resource’, the element that generates the daymaster. In his Four Pillars, Kisenosato is daymaster yang earth (Wu) born in the month of the horse (Wu). His fire element is the usful element in his chart, which is his resource element and indicates that particularly between ages 11 1/2 to 31 1/2 he has good resources. However it is yang fire which is ‘unbecoming resource’ – it can make him rebellious towards authority (amongst other things), and this is confirmed by his life situations and also by the mark on his forehead. 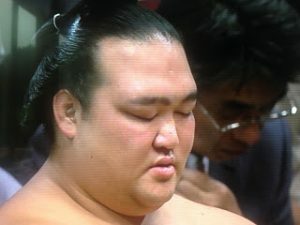 Furthermore, Kisenosato’s right ear has ‘damage’ at the top rim, as you can see it is not rounded, but rather uneven and jagged at the edge. This indicates difficulties in life around age 9-11, but there is no info online about this age of his life, so we can assume, that he opted to go into a sumo stable at age 15 instead of staying at school because of either lack of support from his parents, or because of problems that he carried with him from his earlier childhood, most likely to do with a rebellious attitude. Both of these are caused by problems with the resource element (as seen in his face). On a side note, the forehead is also the Li Trigram, fire. The question is: will he win today? Today is a renzi day in the Chinese calendar (yang water rat). Fire is favourable in Kisenosato’s chart, but that doesn’t necessarily mean water is unfavourable. 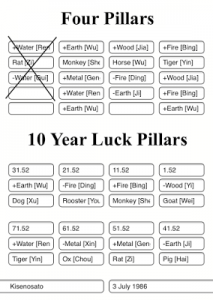 looking at his life path, he has achieved success when fire is strongest in years or in his luck pillars and metal is not useful in his chart, which means that water is useful…and represents his wealth element. He does not have such a great wealth element in his face (find out why at my upcoming face reading course on the Gold Coast, Queensland). ….now it is the next day and I am pleased to report that he did win the tournament once again! In this result it is another way to confirm that fire is useful in his chart, because this is the dingyou (yin fire rooster) year. Fire is the stem and rooster is the branch. The stem is our ‘action.’ The branch is the foundation, but they are in conflict elementally, which are the same two stem and branch combination that he grew up with (check his Luck Pillars). Even he is amazed at his win, but we who study metaphysics can give explanations! 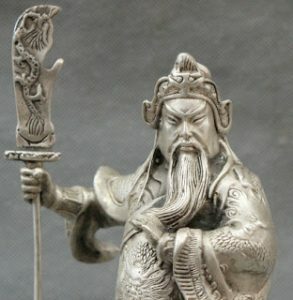 Obviously a lucky but tumultuous time in his life, bringing great conflict and achievement, helping him to win the ‘Fighting Spirit’ award when he was younger. “The silkworm eyebrows stood up fiercely and the red phoenix eyes glared as, sword in hand he rode hastily forth to cut down the audacious Prime Minister for his impertinence.” Romance of the Three Kingdoms by Luo Guanzhong (Chapter 20). We will learn more about Guanyu when we visit his temple on my next ‘Journey to the West’ Feng Shui Tour of China in September 2017. Looking into the future, this is most certainly the peak period of Kisenosato’s life, and whether he goes into life as a senior official in sumo remains to be seen, but it is his intended career to be a coach/trainer for other sumo fighters in the future. Congratulations Kisenosato, what an exciting bout yesterday!